Arizona Governor Jan Brewer meeting with President Barack Obama in June 2010 in the wake of SB 1070, to discuss immigration and border security issues. WOW!! !….Mexico doesn’t want their “OWN” people! The shoe is on the other foot and the Mexicans from the State of Sonora, Mexico do not like it. Can you believe the nerve of these people? It’s almost funny. The State of Sonora is angry at the influx of Mexicans into Mexico!!! Nine state legislators from the Mexican State of Sonora traveled to Tucson to complain about Arizona’s new employer crackdown on illegals from Mexico. It seems that many Mexican illegals are returning to their hometowns and the officials in the Sonora state government are ticked off. At a news conference, the Sonoran legislators said that Sonora — Arizona’s southern neighbor, made up of mostly small towns — cannot handle the demand for housing, jobs and schools it will face as illegal Mexican workers [in Tucson] return to their hometowns without jobs or money. “Mexico is not prepared for this, for the tremendous problems it will face as more and more Mexicans working in Arizona and sending money to their families return to hometowns in Sonora without jobs,” she said. The Arizona law punishes Arizona employers who knowingly hire individuals without valid legal documents to work in the United States. Penalties include suspension of, or loss of, their business license. ‘We are one family, socially and economically,’ said Amparano of the people of Sonora and Arizona. The United States is a sovereign nation, not a subsidiary of Mexico, and its taxpayers are not responsible for the welfare of Mexico’s citizens. It’s time for the Mexican government, and its citizens, to stop feeding parasitically off the United States and to start taking care of its/their own needs. Too bad that other states within the USA don’t pass a law just like that passed by Arizona . Maybe that’s the answer, since our own Congress will do nothing! Foreigners will not be a burden to the taxpayers. No welfare, no food stamps, no health care, or other government assistance programs. Any burden will be deported. If foreigners come here and buy land… options will be restricted. Certain parcels including waterfront property are reserved for citizens naturally born into this country. This will take less than thirty seconds to read. If you agree, please pass it on. An idea whose time has come: Somehow, that doesn’t seem logical. We do not have an elite that is above the law. The self-serving must stop. This is a good way to do that. It is an idea whose time has come. Congress shall make no law that applies to the citizens of the United States that does not apply equally to all members of Congress, Senators and/or Representatives; and, Congress shall make no law that applies to all members of Congress, Senators and/or Representatives that does not apply equally to the citizens of the United States. 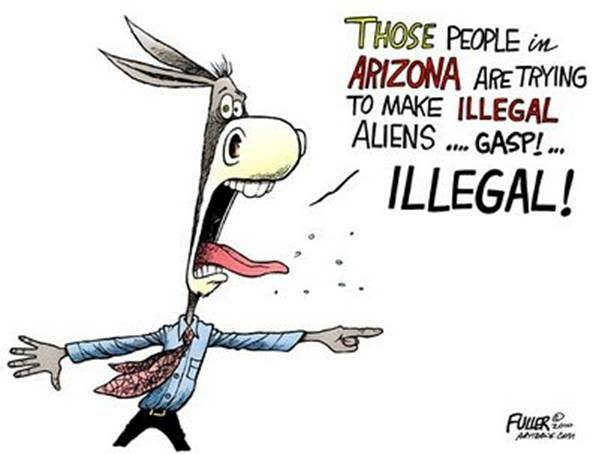 [NOTE: In late April 2010 this item began to be circulated anew, with many readers misinterpreting the included quotes to be a reaction to SB 1070 (Arizona’s controversial immigration law, which had been signed into effect on 23 April 2010), but by then the piece was a two-year-old news story which referred to a related but completely different law. Mexico let 100s of 1000s of illegals march through their country to the USA. Why didn’t they stop them? ROFMAO….Well, lately the vigilante groups are running the Cartels outta town…and this is sanctioned by the Mexican Government! Maybe…just maybe they should have remained at home and fought for their own country!